The growth of polluting microplastics in the Irish environment has been confirmed by the Environmental Protection Agency (EPA). The agency has published evidence of the sources and scale of “microbeads” – and their threat in Irish freshwaters – for the first time, warning of the risk to public health. The EPA published the findings of researchers at the Marine and Freshwater Research Centre at Galway Mayo Institute of Technology (GMIT) confirming how microbeads are spreading into rivers and lakes and threatening species living in these ecosystems. The evidence is likely accelerate Government plans to introduce a ban on use of microbeads in cosmetic and cleaning products. In March this year, Minister for Housing Simon Coveney launched a public consultation on proposed legislation to eliminate their use – as has been introduced in some countries. Publication of the research coincides with scientists and engineers from the University of Bath announcing they have developed biodegradable cellulose microbeads from a sustainable source “that could potentially replace harmful plastic ones that contribute to ocean pollution”. The GMIT research supports the view that the best way to tackle and reduce microplastic pollution is to remove it at source, rather than trying to address it after pollution occurs. The threat to the marine environment is already known, and confirmed by other research by GMIT which has revealed the scale of their ingestion by marine life with fatal consequences. Microplastics are also contributing to a global problem of marine litter. 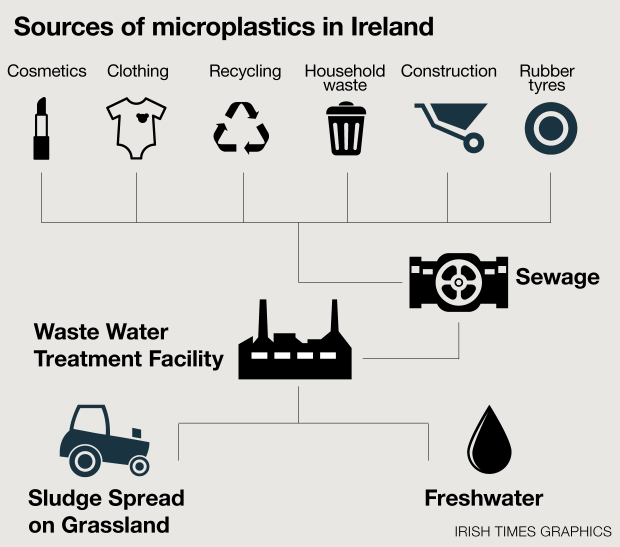 The latest GMIT research has identified some of the main sources of microplastics in Ireland. These include the plastics manufacturing and recycling industries; landfill, urban wastewater treatment plants, septic tanks and the sewage sludge/biosolids derived from such plants. Urban wastewater treatment plants were identified as one of the largest “point sources”; receiving microplastics from a number of different sources. – Accidental ingestion of water containing microplastics through bathing. “In addition to microbeads washed into the sewer from the use of personal care products, synthetic fibres from clothing transported in washing machine wastewater are another significant contributor of microplastics found in urban wastewater treatment plants,” said Dr Anne Marie Mahon of GMIT. Although some microplastics are discharged with the wastewater into receiving freshwater systems, most of these fibres become trapped in sewage sludge at treatment plants, which include a settlement treatment process, she said. Spreading of these sludges on farm land “poses risks to terrestrial ecosystems and potentially further risks to freshwater systems”. The study also identified 24 different species of molluscs, fish, birds, mammals and crustaceans, as being potentially at risk from microbeads, many of which are classified as endangered or vulnerable, such as the freshwater pearl mussel. “This research provides us with vital national level data and information on the environmental sources and risks posed by microplastics in Irish freshwaters,” said EPA research manager Dr Alice Wemaere. “Consumers can help by checking the product labels for cosmetics and cleaners to see if they certify they are microplastic free,” she added. 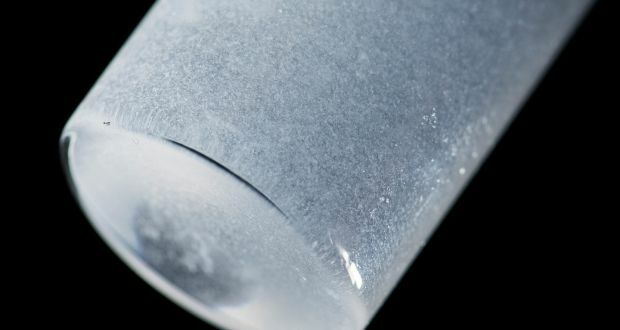 The Government rejected legislation with a view to introducing a ban on microbead use proposed by Green Party Senator Grace O’Sullivan in the Seanad last October, and in May this year reversed a decision to oppose a Labour Party Bill. Mr Coveney had planned to reject Labour’s Prohibition of Microplastics Bill on the grounds it could place Ireland in breach of EU Treaty articles on the free movement of goods and that it was flawed in definitions, enforcement and its “level of ambition”. But in the Dáil later he told its author, Cork East Labour TD Seán Sherlock, the Government would not oppose the legislation but would probably abstain and allow it to proceed on the basis that “if and when we produce the Government’s legislative response to this whether in the foreshore Bill or in a separate piece of legislation after the work that needs to be done first”.